Baguazhang from the Jiulong system is well known for being able to provide the student with improved stamina, health and longevity. 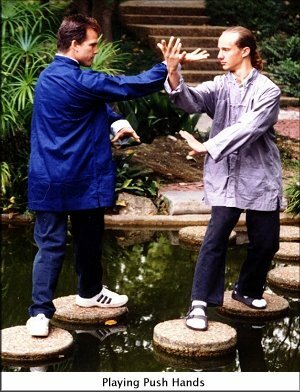 We should not forget that as Baguazhang evolved from the Daoists it became a superlative martial art. An art that when properly taught and practiced allows a student the ability to be in control of a dangerous life threatening situation. Once you understand the Jiulong eight basic forms for health and their underlying principles, you will be shown how to train for speed, power, internal energy and tactical street combat knowledge. It is sensible to practice for health first for if you are not fit internally and externally it stands to reason that you cannot fight to protect yourself. Jiulong students who embark on the martial art (Nine Dragon Boxing) training learn Zhandou (combative) Gong (skill). They come to understand how to use Baguazhang tactics to neutralize virtually any attack easily and with little physical effort. Jiulong Baguazhang as a martial art was never intended to be a sport or demonstration art. Chinese bodyguards designed Nine-Dragon Boxing for “war time applications”. The methods were created to help them survive against one or more opponents intent upon killing the bodyguard or his employer. Nine-Dragon Boxing techniques are serious battle tested methods. 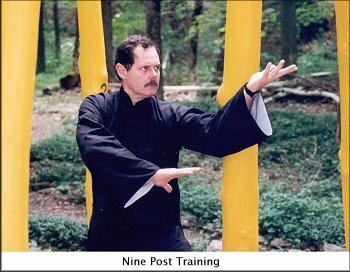 Nine-Dragon applications can range from simply fending off mild or annoying attacks to striking with the palms or any part of the body. Nine-Dragon Boxers are highly efficient at using locks and throws that can break legs, arms or even necks to instantly incapacitate enemies who are threatening your life. Today the tradition continues with Dr. Painter and his Jiulong study group leaders. Many of these instructors are experienced in Qigong healing methods and there are also numerous instructors who are professional bodyguards, law enforcement trainers, and teachers of military hand to hand combat. Our Nine-Dragon Boxing art is not one of endless hollow forms, wide stances, fancy hand flourishes or mystical demonstrations often presented as “authentic” Baguazhang. It is based on principles that are expressed as compact practical combat forms. There is no “magical Qi” energy here. Just honest time tested methods that kept the Li family and their clients safe for over 100 years. Handed down to Dr. Painter from the well-organized combat experiences of the Li family, modern day Jiulong continues to evolve, as we come to understand more of human biomechanics. The modern Jiulong Baguazhang Association has an advisory board of distinguished medical doctors, sport medicine experts, physiologists, military tactical drillmasters and law enforcement trainers. The combat principles of todayÂ’s Jiulong apply modern bio-kinetics coupled with knowledge of practical internal power development and “real world” defensive tactics. Like the Yijing on which the art is based Nine-Dragon Boxing is a dynamic, living and ever evolving combat system. 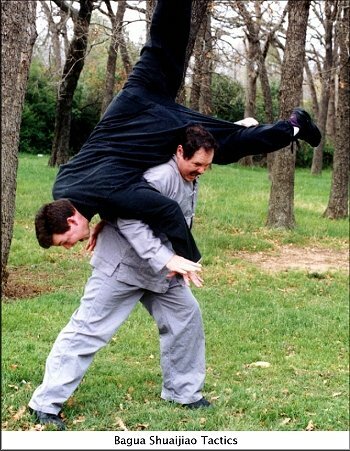 Martial training for combat is not easy and requires much dedication. Today there are numerous divisions of “martial art” practice. Contemporary Wushu as promoted for sport or tournaments play in China or the west is in reality not truly combat effective. Compact stances, deft footwork, power training along with a study of defensive tactics and anatomical pressure points have been removed in favor of creating forms that are aesthetically pleasing in outward appearance. Students of traditional Baguazhang, the art practiced before the development of contemporary Wushu, are required to do much more than just learn endless forms. Training for strength and flexibility of the muscles, ligaments, tendons and bones will have to be undertaken using special forms and equipment. There are also practical combat applications against real opponents. Students spend time learning to apply the principles to throws, strikes, pressure points and many other methods. Mental energy combined with subtle mind/body power exercises teaches us how to coordinate each action and muscle to work in synergy. When understood this will create a force called Jin or subtle body power. Jin can produce an amazing level of speed and power. Jin power is often mistaken for Qi. It is not Qi. Jin is the result of a very special physical and mental training to produce a high level of coordination between the muscles and mind working in perfect harmony. This correlation of subtle movements not Qi will create what appears to be an almost super normal level of strength in the internal martial arts expert. Baguazhang boxers feel that the palm is a much better weapon of offense and defense than the closed fist. The fist is a club with limited use except for pounding. The palm on the other hand can offer numerous surfaces ranging from sharp pointed fingers as in a spear hand to broad surfaces like the palm for imparting devastatingly powerful fluid shock blows not to mention the edge of the palm that can slice and cut like an axe blade. 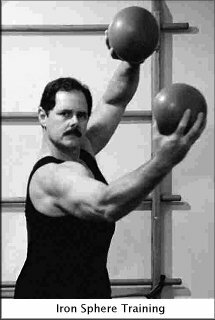 The open palm can also lift, catch, scoop, deflect, uplift or grab in defensive maneuvers with only a minor adjustment of angle. All of this can be done with the hand opened and in a relatively relaxed position. Relaxation is important for speed and momentum in defense and offense. The open hand does not have a tendency to tighten up the forearm and shoulder like the fist and therefore is better suited for faster response than a clenched fist. As a martial art Nine-Dragon Postures makes use of close in fighting methods. In the old style combat methods there was almost no space between the opponents body and the Baguazhang boxers. The Nine-Dragon Boxer moves into the opponent like a rushing wave, surrounds him, winds him and wraps him with his body/mind energy. The rushing force overwhelms his center of balance. He loses balance and experiences the fear of sudden loss of control. The touch in neutralizing is soft yet powerful. From the first touch there is a feeling of control exerted from the Nine-Dragon Boxer into the spine of his enemy that produces a feeling of confusion and disorientation. As soon as the enemy feels himself being pushed in one direction and attempts to adjust, the force shifts and shifts again like a swirling maelstrom. In striking the Nine-Dragon body/mind force is devastating, sending fluid shock waves through the enemies torso and head. These shock waves when applied as palm strikes have such force that they can disrupt internal organs and break bone. Throwing and locking arts are also part of the Nine-Dragon Boxers arsenal of weapons. The RYG Principle: To enter from the safe zone (Green) to caution zone (Yellow) and into danger zone (Red) in the blink of an eye. The Wedge Principle: To neutralize, deflect and take the center on the first touch using the Ball and Wedge like the prow of a boat. Seek the Ridge Pole Principle: To control his spinal column and thus his balance as the primary first objective when attacked. The Brain Blink Principle: To confuse and disorient the enemy at first touch. The Straight to Circle, Circle to Straight Principle: To move in linear when he circles and to move in circling when he moves straight. Magnetic Body Principle: To adhere to the enemy with the body when in close and control his balance with any part of the torso or limbs. This goes beyond physical and is part of the body/mind control. The Dragon Body Principle: To flow and move like a water serpent. We learn to avoid being struck or grabbed as we attack. The goal of this type of training is to prepare the individual in mind, body and spirit for actual defense of his or her life not to win a shiny trophy. Through trial and tribulation the student slowly learns to gain control of the Xin (emotional energy) and direct its power to create useful internal energy throughout the body. When all eight postures are absorbed into the mind and body you begin combining the energies of the eight gates until all dissolve into one. With time, training and patience the separate methods solve into the final stage. Dr. Painter calls it the Yizhang (Mind Palm) in which all actions become spontaneous and free of prearranged ideas or images. We now have non-static and non-prearranged, e-style moving forms where mental energy merges with physical shapes to create pure spontaneous function. As this becomes natural the Jiulong Men (Ninth Dragon Gate) will open for you. The metamorphosis from sitting to free-form mind Posture takes a number of hours of dedicated and constant practice. This after all is the evolutionary message of the Yijing, to go from no form to form then return to no form once again. If you would like to find out more about Jiulong Baguazhang and would like to talk with other students of this martial art, about the art, then you might want to consider joining our Jiulong Baguazhang Facebook Group. Click below to join.